Live the luxurious pet life with our Bamboo Diners. These diners feature removable, bacteria resistant stainless steel bowls with an attractive poly resin exterior durable bases. The removable skid-free rubbers feet help ensure quiet, spill-free dining. These are available in different colors to match any decor. 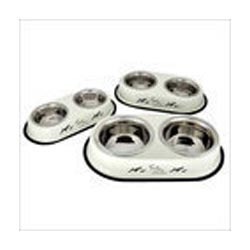 A beautiful double dinner with the combination of decorated plastic with virgin material and two 1/2 Pint Stainless Steel Bowl and well designed for small dogs and cats. Our reputed entity is engaged in supplying Double Pet Bowl. Being a well-renowned entity, we are engaged in providing a distinguished range of Double Duck Bowl Set. Our customers can purchase from us a wide range of double dinner bowls. Manufactured using quality stainless steel these are known for corrosion resistance. Moreover, these have perfect finish and also light in weight. In addition to this, we also have the facility to customize these in a variety of sizes. Our customers can purchase these at market leading prices. Our company is engaged in offering a qualitative range of anti skid eight shaped double diner that are known for their robust construction, durability and high functionality. These diners are available in various shapes and designs thus providing comfort to the pets. We offer these diners at most competitive prices. ‘INDIAN DINERS’ serves Indian Chinese and Continental Cuisine. Experience authentic Indian cuisine from the handpicked menu, specially crafted by the chef; in contemporary yet ethnic ambience. The Chef strives to ensure perfection to the guests expectations by interacting with them for ordering the food. 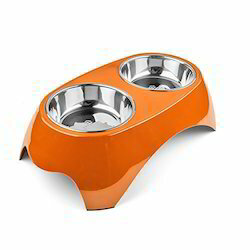 Adjustable double dinner bowls, that can be easily adjusted as per the height of pets for providing them convenient feeding and drinking.